Synchronicity Boutique is 1 of only 3 stores in Maryland chosen to carry the fabulous pageant dresses and pageant gowns by Ritzee Originals! Now Synchronicity Boutique is uniquely able to offer affordable pageant dresses that meet all local and national pageant dress requirements. Looking for a customized, hand-beaded dress, with or without a slit, that needs to be under $1,000? You WILL find it here! Prefer to special order? Choose from 14 chiffon colors, 5 organza colors, and countless designs. Best of all, Synchronicity still has the guaranteed lowest prices of all authorized retailers at the time of purchase, and we will sell only 1 of a style for a specific pageant! Better hurry though- most of the Ritzee Originals dresses we’ve received have been sold ‘directly from the shipping boxes they day they arrive,’ never even making it to the sales floor! Demand for these dresses has been incredible. Not sure Ritzee is what you want? Choose from pageant dresses by Sherri Hill, Tony Bowls, Mac Duggal, Jovani, or the countless others you’ll find at Synchronicity Boutique! 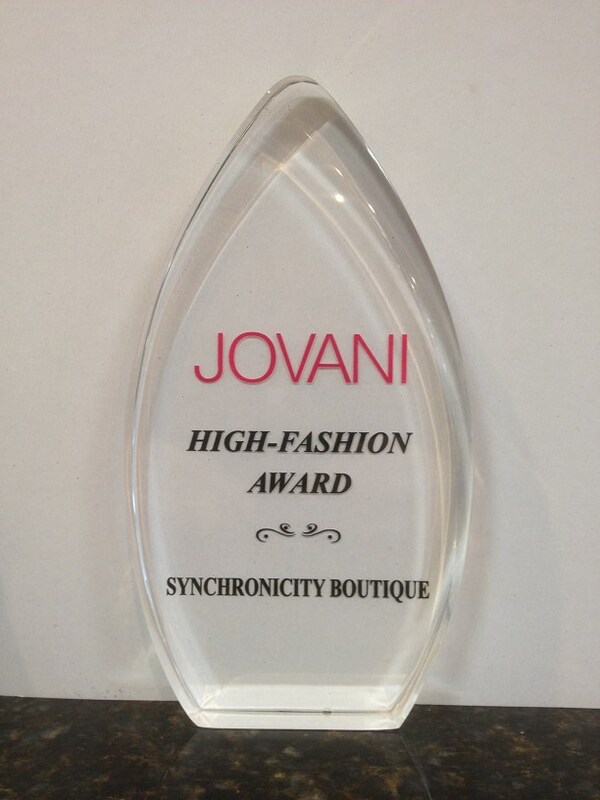 BALTIMORE – Synchronicity Boutique, the Baltimore-Washington area’s “hottest special occasion clothing and accessory shop for adults and teens,” has received the Jovani “High Fashion Award”, presented during the PROM 2013 Fashion Shows held in Atlanta. An internationally-recognized brand that can be seen on A-list celebrities and on cover spreads of high fashion magazines, Jovani sells evening gowns, cocktail dresses and separates to over 3,000 stores worldwide. It has won the National Prom Association’s Retailers Choice Awards for Best Manufacturer Quality and Best Prom Fashion Design, as well as the Debi and Diva awards for design excellence. “Jovani is one of our most popular designers. It is an honor to be recognized as one of their top retailers based on our customer service and business success,” said Synchronicity Boutique Owner Karen Mazer. Named “Baltimore’s Best” by Baltimore Magazine, Synchronicity Boutique is the only Baltimore-Area retailer – and just one of two in Maryland – recognized by the Top 10 Prom organization as one of the nation’s Top 10 prom stores. During prom season alone, it sold over 1,400 dresses, sizes 00 to 30W, in a variety of price points. Known as the area’s go-to place for special occasion fashions, Synchronicity Boutique outfits customers of all ages from all over the world for proms, homecomings, ring dances, pageants, Bat Mitzvahs, cocktail parties, Cotillions, graduations, Quinceaneras, Sweet Sixteens, college formals, military balls, weddings and other black-tie events. To complement the dresses and gowns, Synchronicity Boutique carries “bling” and accessories, including jewelry, purses, Julie France undergarments, Hollywood fashion tape, wraps and cute shoes. 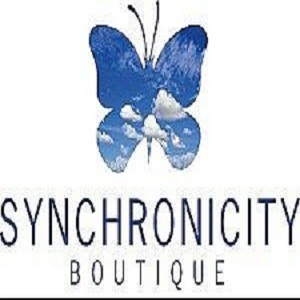 Open since 2003, Synchronicity Boutique is located in Hooks Village, at 25 Hooks Lane, off I-695 Beltway Exit 20. Hours are Mondays through Saturdays, 10 a.m. to 6 p.m., and Sundays, noon to 5 p.m. Private appointments are welcome, but never required. Merchandise also can be viewed online and purchased by phone. For more information, call 410-486-8866 or 877.919.PROM or visit http://www.SynchronicityBoutique.com. Trends setting prom dresses and formal gowns for homecoming by La Femme Fashions have made an incredible prom fashion statement for the social occasion industry throughout this decade. With embellishment that raises the bar for both elaborate and formal ornamentation to every prom dress, LaFemme prom designers seem to constantly be adding a unique combination of accent that keeps the prom dress industry talking about and loving the new stylish looks of La Femme. Throughout the 2012 prom season La Femme has had many formal prom dresses that are requested again and again at some of America’s best prom dress stores like Synchronicity Boutique. First, with the 2011 prom season a cut out printed satin with a deep back detail lead the request list for all prom shopping. Then again in 2011 a gorgeous coral a-line chiffon with cut aurora stoning became the look requested by prom shoppers across the country. From all over sequins to soft flowing chiffons, from long prom dresses to short cocktail dresses with dramatic back treatments, the 2012 prom dress collection is again making a statement on the popularity of the look of La Femme dresses with heavy requests once again being placed on La Femme prom styles. BALTIMORE MARYLAND – 17-April-2012 – While teenagers may be worried about their dates and outfits for prom, their parents should be worried about the impact on their wallets as average prom costs increase, according to a new survey. Parents with teenage kids are expected to shell out an average of $1,078 for prom in 2012, according to a survey release by Visa Thursday. The average is up more than $200 from the $807 average in 2011. Parents have celebrities to thank for the increased spending. The study says teens are influenced by “red carpet” trends that pack a powerful price tag. HOW MUCH ARE PROM DRESSES AND TUXEDOS IN MARYLAND? When it comes to attire, the study concluded ladies spend an average of $231 on a prom dress, $26 on lingerie or hosiery, $45 on shoes and $23 on a handbag. Men, on the other hand, spend an average of $127 on a tuxedo and another $100 on accessories like a tie, shoes and cummerbund. Other expenses for the ladies include an average of $35 for a manicure, $33 for makeup, $50 to get their hair done, $32 for jewelry and $10 for their date’s boutonniere. Men are averaging $20 for their date’s corsage and an average of $75 if they pay for a dinner, which includes two main dishes and an appetizer or a salad. Add a $100 bill for a limousine — which is split between a group of friends — and dance tickets at up to $50, and the grand total can break the bank. Visa interviewed 1,000 households at the end of March to get the results.